bailey unleashed .com: is bailey on santa's naughty list? but bailey did a little mischief with her. 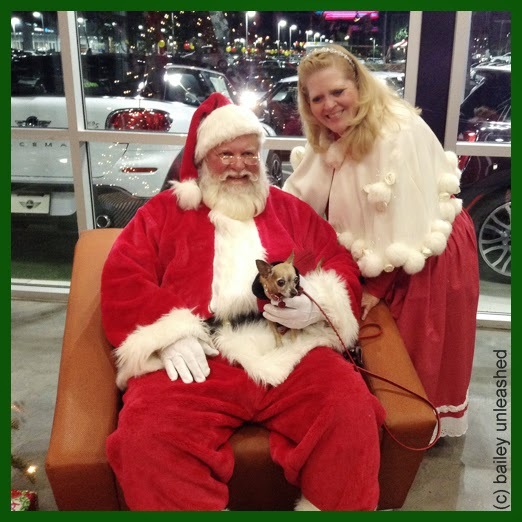 when mrs santa went to pet bailey on her head, well, bailey kinda snapped at her! oh dear. 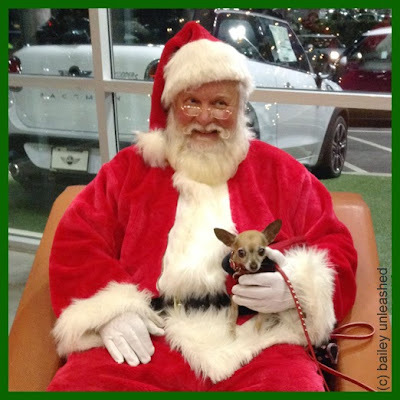 they made up afterwards, but i hope that didn't put bailey on santa's naughty list. With all Bailey's been through she's not gonna be on anybody's naughty list. She's one VERY special girlie and deserves tons of treats! Santa is only bringing good things for Bailey! I don't think so. Mrs. Claus probably scared her. I would be protective of my head too if I was Bailey. Mrs Santa should ask before she touches, haha. No way could Bailey be on that naughty list. It's ok Bailey, don't feel bad that you snapped at Mrs. Claus, no one should touch your little head. You look so cute sitting with Santa. We can't imagine they will put Bailey on Santa's naughty list. After all Mrs. Santa didn't have permission to pet Bailey on the head I'm sure. She could have asked nicely. Never!! Bailey is ALWAYS on the "nice" list! Bailey on the naughty list.... NEVER!! Bailey and her adorable head need to be protected! So excited she is up to defending her own sweet little self! !